If you have been told you have periodontal (gum) disease, you're not alone. An estimated 80 percent of adults currently have some form of the disease. Periodontal diseases range from simple gum inflammation to serious disease that results in major damage to the soft tissue and bone that support the teeth. In the worst cases, teeth are lost. What causes Periodontal Disease? Our mouths are full of bacteria. These bacteria, along with mucus and other particles, constantly form a sticky, colorless "plaque" on teeth. Brushing and flossing help get rid of plaque. Plaque that is not removed can harden and form bacteria-harboring "tartar" that brushing doesn't clean. Only a professional cleaning by a dentist or dental hygienist can remove tartar. Gingivitis: The longer plaque and tartar are on teeth, the more harmful they become. The bacteria cause inflammation of the gums that is called "gingivitis." In gingivitis, the gums become red, swollen and can bleed easily. Gingivitis is a mild form of gum disease that can usually be reversed with daily brushing and flossing, and regular cleaning by a dentist.This form of gum disease does not include any loss of bone and tissue that hold teeth in place. Periodontitis: When gingivitis is not treated, it can advance to "periodontitis" (which means "inflammation around the tooth.") In periodontitis, gums pull away from the teeth and form "pockets" that are infected. The body's immune system fights the bacteria as the plaque spreads and grows below the gum line. Bacterial toxins and the body's enzymes fighting the infection actually start to break down the bone and connective tissue that hold teeth in place. If not treated, the bones, gums, and connective tissue that support the teeth are destroyed. The teeth may eventually become loose and have to be removed. Risk Factors: Smoking Need another reason to quit smoking?? Smoking is one of the most significant risk factors associated with the development of periodontitis. Additionally, smoking can lower the chances of success of some treatments Hormonal changes in girls/women. These changes can make gums more sensitive and make it easier for gingivitis to develop Diabetes. People with diabetes are at higher risk for developing infections, including periodontal disease Stress. Research shows that stress can make it more difficult for our bodies to fight infection, including periodontal disease Medications. Some drugs, such as antidepressants and some heart medicines, can affect oral health because they lessen the flow of saliva. (Saliva has a protective effect on teeth and gums.) Illnesses. 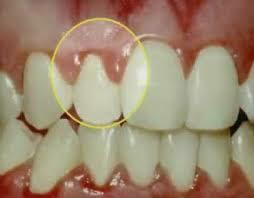 Diseases like cancer or AIDS and their treatments can also affect the health of gums Genetic susceptibility. Some people are more prone to severe periodontal disease than others Symptoms of Gum Disease: Symptoms are often not noticeable until the disease is advanced. They include: Bad breath that won't go away Red or swollen gums Tender or bleeding gums Painful chewing Loose teeth Sensitive teeth Treatment of Gum Disease: Deep Cleaning (Scaling and Root Planing): The dentist, periodontist removes the plaque through a deep-cleaning method called scaling and root planing. Scaling means scraping off the tartar from above and below the gum line. Root planing gets rid of rough spots on the tooth root where the germs gather, and helps remove bacteria that contribute to the disease. Surgical Treatments: Flap Surgery —surgery might be necessary if inflammation and deep pockets remain following treatment with deep cleaning and medications. A periodontist may perform flap surgery to remove tartar deposits in deep pockets or to reduce the periodontal pocket and make it easier for the patient, dentist, and hygienist to keep the area clean. This common surgery involves lifting back the gums and removing the tartar. The gums are then sutured back in place so that the tissue fits snugly around the tooth again. Bone and Tissue Grafts —in addition to flap surgery, your periodontist may suggest bone or tissue grafts. Grafting is a way to replace or encourage new growth of bone or gum tissue destroyed by periodontitis. A technique that can be used with bone grafting is called guided tissue regeneration, in which a small piece of mesh-like fabric is inserted between the bone and gum tissue. This keeps the gum tissue from growing into the area where the bone should be, allowing the bone and connective tissue to regrow. Since each case is different, it is not possible to predict with certainty which grafts will be successful over the long-term. Treatment results depend on many things, including severity of the disease, ability to maintain oral hygiene at home, and certain risk factors, such as smoking, which may lower the chances of success.